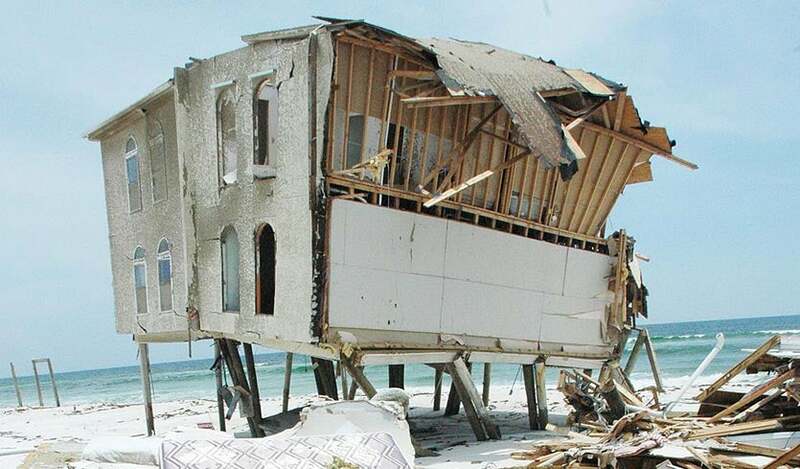 Above: A beachfront home in Navarre Beach, Florida largely destroyed by Hurricane Dennis in 2005. FEMA Photo by photographer Leif Skoogfors (FEMA Photo Library). Hurricane Michael has the Florida Panhandle/Big Bend region in its crosshairs, with a landfall on Wednesday predicted by all of our reliable track models. This part of Florida has been pounded by many hurricanes in recent decades, and we can look back at these storms to help us anticipate what Michael’s impact might be. History tells us that storm surge is the primary danger from hurricanes in this region, but wind damage also a significant threat. Figure 1. 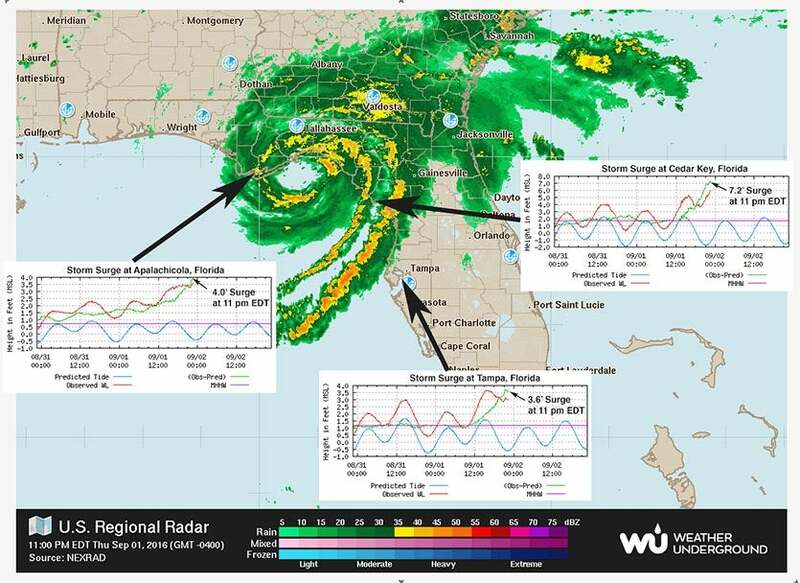 Regional radar of Hurricane Hermine at 11 pm EDT September 1, 2016, with three time traces of the storm surge at water gages in Apalachicola, Cedar Key and Tampa, Florida. The storm surge (green line) had peaked in Tampa at this time, but was still rising at Apalachicola and Cedar Key. Surge images were taken from NOAA Tides and Currents page for Hermine. The most recent hurricane to hit the region was Hurricane Hermine, which struck the Big Bend coast just east of St. Marks as a Category 1 hurricane with 80 mph winds on September 2, 2016. Hermine broke a 10-year hurricane landfall drought for Florida which had extended back to October 2005 (Hurricane Wilma). Hermine killed one person, and the storm did $550 million in damage, mostly from storm surge and high winds. Hermine made landfall along a section of the Florida coast that has a small population, which kept the damage relatively low. Hermine’s highest measured storm surge was 7.5 ft above normal tide levels at Cedar Key. Hermine’s storm tide (the combined effect of the surge and tide) was 5.98 feet above the high tide mark (Mean Higher High Water, or MHHW), setting an all-time record there--an impressive feat for a site that has records going back to 1914. Hermine produced maximum inundation levels of 4 to 7 ft above MHHW to the east of the landfall location, along the immediate coasts of Jefferson, Taylor, Dixie, and Levy Counties, and 2 to 4 ft above ground level south of Cedar Key to Ft. Myers, including Tampa Bay. Inundation levels of 2 to 4 ft above ground level also occurred west of Hermine’s landfall point from St. Marks westward to Cape San Blas (Wakulla, Franklin, and Gulf Counties). Hermine produced heavy rainfall across much of western and northern Florida, extending northward across coastal sections of Georgia, South Carolina, and North Carolina, with a maximum of 22.36” near Tarpon Springs, Florida. Flooding occurred on several rivers in northern Florida, although only the Anclote River reached major flood stage. The last major hurricane to hit the Florida Panhandle/Big Bend region was Hurricane Dennis, which made landfall in the western Florida Panhandle as a Category 3 storm with 120 mph winds and a central pressure of 946 mb on July 10, 2005. Dennis killed 3 people in Florida and did $3.3 billion in damage (2018 dollars). Dennis brought a storm surge of 6 - 9 feet to Apalachee Bay, inundating parts of the town of St. Marks and other nearby areas. A storm surge of 4 - 6 ft occurred elsewhere in the Florida Panhandle. Dennis set the all-time high-water mark at Apalachicola (records since 1967) of 6.43 above MHHW. The surge in Apalachee Bay was unexpected, since it lay 170 miles east of Dennis’s landfall location. Subsequent research revealed that the track of Dennis, in combination with the bathymetry of the region, combined to create a “shelf wave” that propagated northwards along the coast, inundating the Big Bend region 3 – 4 ft higher than existing storm surge models had predicted. A similar situation may occur with Michael, but NHC now has storm surge models that can handle this situation. 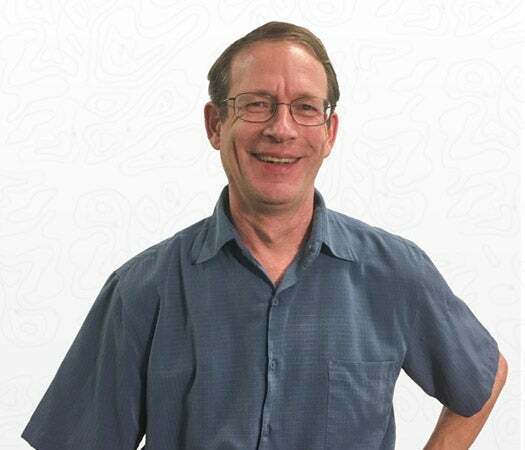 See a SLOSH model animation of Dennis' storm surge here. Dennis was the first hurricane I ever blogged about. Hurricane Ivan made landfall just west of Gulf Shores, Alabama as a Category 3 hurricane with 120 mph winds on September 16, 2004. Though not technically a Florida landfall, Ivan did tremendous damage in the Florida Panhandle, bringing the highest water levels on record to Pensacola, FL: 9.54’ above MHHW (records go back to 1923). Ivan killed 57 and did $27.9 billion in damage to the U.S. The 117 tornadoes spawned by Ivan were a record for a landfalling hurricane. Ivan brought a storm surge of 10 - 15 ft from Destin in the Florida panhandle westward to Mobile Bay/Baldwin County, Alabama. Storm surge values of 6 - 9 ft were observed from Destin eastward to St. Marks in the Florida Big Bend region. Lesser values of storm surge continued east and southward along the Florida west coast, with 3.5 ft reported in Hillsborough Bay/Tampa Bay. Figure 2. 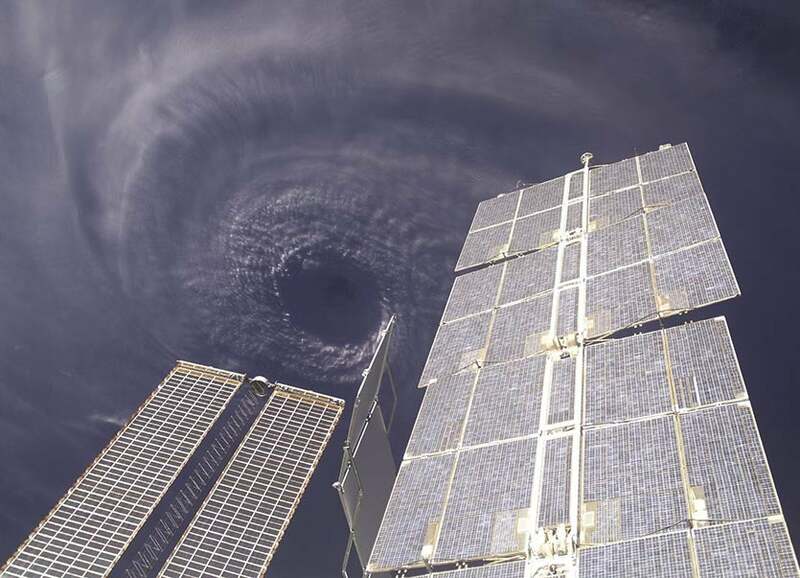 Hurricane Ivan as seen from the ISS on September 11, 2004. At the time, Ivan was a Category 5 hurricane with 165 mph winds. Ivan caused extensive damage to coastal and inland areas of the United States. Portions of the Interstate 10 bridge system across Pensacola Bay, Florida were severely damaged in several locations as a result of severe wave action on top of the 10 - 15 ft storm surge. As much as a quarter-mile of the bridge collapsed into the bay. The U.S Highway 90 Causeway across the northern part of the bay was also heavily damaged. 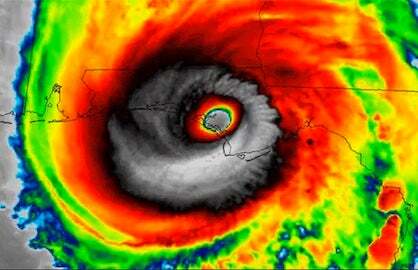 To the south of Pensacola, Florida, Perdido Key bore the brunt of Ivan's fury and was essentially leveled. The most recent October landfalling hurricane in Florida’s Panhandle was Hurricane Opal, which made landfall near the Okaloosa-Santa Rosa county line as a Category 3 hurricane with 125 mph winds on October 4, 1995. Opal killed 13 people in the U.S., and did $7.8 billion in damage (2018 dollars). Only one of the U.S. deaths was in Florida (from a tornado). Nine deaths occurred in Georgia, five of them from falling trees. Opal had was a high-end Category 4 hurricane with 150 mph winds less than 12 hours before landfall, but then weakened apruptly. However, these powerful winds piled up a huge storm surge with high waves on top that inundated the coast up to 15 – 20 feet above sea level just east of Miramar Beach. Opal set the all-time high water mark at Panama City, FL (records since 1973) of 5.72 ft above MHHW. Opal’s surge was responsible for the majority of the storm’s damage, though wind damage was also severe. The storm surge destroyed a ½-mile length of US-98, making it an 'inlet' of Choctawhatchee Bay. See a SLOSH model animation of Opal's storm surge here. We watched a Central American Gyre (#CAG) evolve into #Hurricane #Michael, which is now forecast to become a major hurricane before landfall in the #Florida Panhandle. Like Hurricane Michael of 2018, Opal got its start in a Central American Gyre—a large area of low pressure over Central America associated with the monsoon flow there (see tweet above). These gyres typically generate extreme rains over Central America and Mexico, and the one associated with Opal was blamed for 31 flooding deaths in Guatemala and 19 in Mexico. 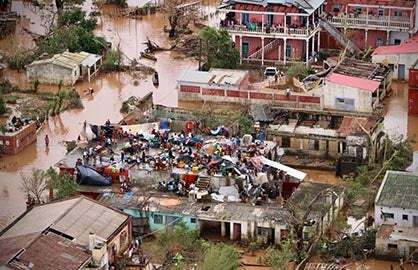 Michael's rains are being blamed for at least 13 deaths in Central America, according to weather.com. One other analogue storm to consider is Hurricane Kate, which made landfall as a Category 2 hurricane with 100 mph winds just west of Apalachicola, FL on November 21, 1985. Kate killed five in the U.S., and did less than $1 billion in damage. 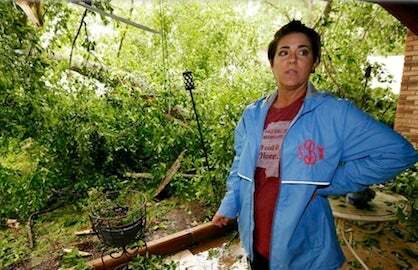 Most of the damage was due to storm surge; Kate brought a storm surge as high as 11 ft to Cape San Blas, FL. We'll have an update on Hurricane Michael this evening.